Now available! The ToyFinity Store has 3 new releases. A $16 Maxx Zero, a $13 Zeroids figure, and a $10 pack of Mordles - not a bad deal! This is the final ToyFinity release of 2016 and you can click here to see what's left. As far as bang for the buck goes, the amount of parts in the Onell Design crossover OSM Gemini Ulstriax - Fugitive from Algol is pretty solid - and if you buy the matching companion Quallerran figure, it's even better. 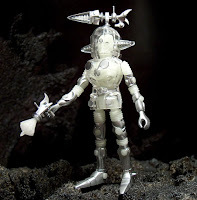 Not only is this a nicely decorated figure molded in light grey plastic, but Onell Design tossed in some bonus parts - dark red clear weapons of Orbitron are thrown in the bag at no extra charge. This is only the second heavily decorated version of Gemini out of a grand total of seven releases. The main, classic yellow one should be your first purchase and this Onell Design special edition should be your next stop. New from The GodBeast! Check out the menu. 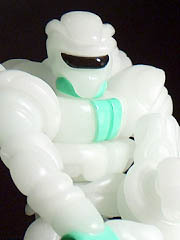 New Bio-Masters (pictured) join Kabuto Mushi figures and a swell comic book from tonight's update. Check out the site to see what's still available. 27 total parts come in Noboto Ao. He might look like a familiar face - the color scheme and head deco recall a popular character from a comic book, TV show, movie, video game, and so on. But who? Well, it's Leonardo. There, I spoiled it for the none of you who didn't already figure this out. What's fascinating is that the figure is just a redecorated Noboto - an Onell Designs character which has been around for years. The generous slathering of pigment on a green body with added bonus grey weapons courtesy of the Robo Force molds completes the look, giving you the turtliest member of the Turtle Club yet. While no date has been given on either, "Next Week!" for Cyclops and "Soon!" for Orbitron in glow-in-the-dark plastic seems to be a thing now. Check out these teases from the official Outer Space Men Instagram. Batch 60! A new Outer Space Man figure, tributes to Ninja Gaiden, Gremlins, Halo, and more await you - and it looks like many are still available at press time. Click here to see the December 8 2016 Onell Design drop menu. 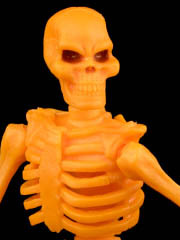 New Onell Design Drop Tonight - New Store, New Skeleden, New OSM Too? Due to some nasty dental surgery, I missed this announcement for a new Onell Design drop tonight at 9:30 PM EST! 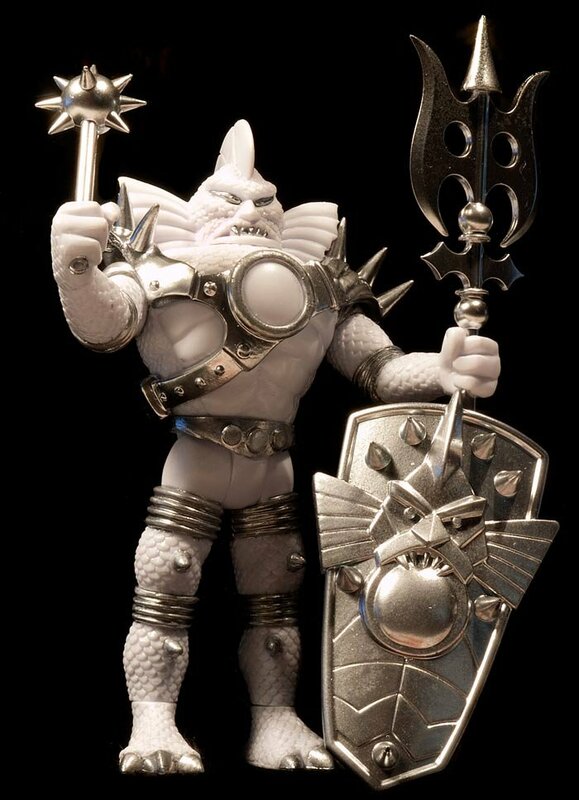 According to the comments, Outer Space Men cameos are likely to join other great goodies inspired by the 1980s - like this cool Skeleden Keldorac! Also take note, Onell Design has a new storefront - hopefully more stable - and you need to make an account prior to the drop or you might miss out. Make yours now. 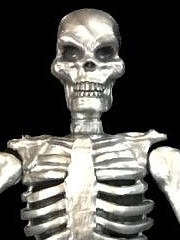 In case you missed it, October Toys quietly dropped the Skeleton Warriors TITAN-800 Skeleton a couple of weeks ago! He's $13, and will be hosting Celebrity Apprentice next season. The Culture Pirates Store added wave 3 of Bit Figs today! Clear green is on the menu with 3 different items at a reasonable $8.00 a pop. 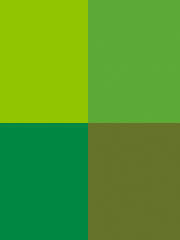 Click here to get your green on. I missed the first release, so it was nice to see that the second run of the DX Crimson Spikesaurian 2.0 was available and had arguably better deco - the shield has an added T-rex skull on it. With five accessories and six heads, there's a lot you can get out of a single figure - and you're charged accordingly. 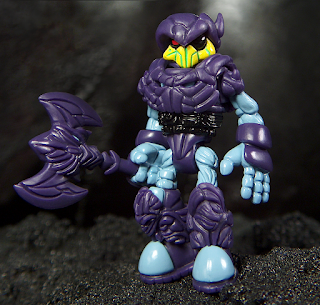 New from the House of Glyos with some help from The Godbeast, Bio-Masters pre-orders are live! What exactly are they? Uh... see above. A ball with wings, claws, tentacles, and more claws will be shipping in just a couple of months. 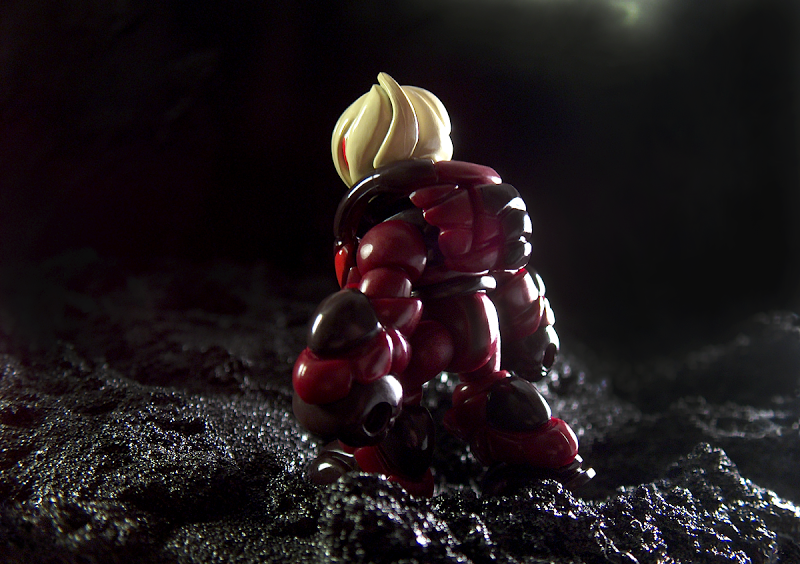 A standard version (pictured) will be joined by glow-in-the-dark ones, and test shots are up for grabs right now. It's new, it's a debut, check it out. 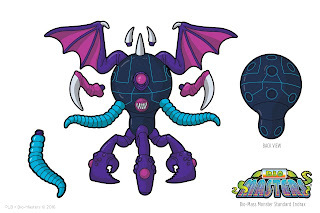 Wave 17 of The Godbeast's Kabuto Mushi line is up now - and it's heavy on references! An Insecticon-inspired vinyl figure joins Kabutos cosplaying as Chop Shop, Modulok, and they're joined by Crayboth friends. An unusual crossover exclusive for you Crayboth completists! 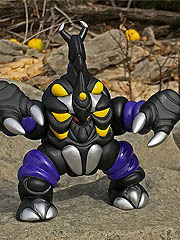 A new Standard Edition Kabuto Mushi is also available. The hero with many faces gets another face with Pheyden Frontier MKII. It's a pretty simple figure with extra deco - it's a Pheyden molded in white with thick paint on the legs, hands, and arms to replicate the molded plastic of the original figure that sold out ages ago. He doesn't have spare heads or anything, but it's a nice one nonetheless. It looks cool, which is a reason to buy it - the Onell Design crew came up with tons of great colorways back when they started, so it's nice to see them brought back for the newcomers or those who lacked the foresight to pick it up 8 years ago. TMNG! The turtliest drop of your dreams will no doubt get you into the Turtle Club with four green teens, a comic-inspired Crayboth figure, Shredder and Foot-inspired Glyninjas, a Shinobish Glyninjas, and a lot more await you. And it was popular enough to cause the shop to be closed to check inventory within a few minutes - at press time nothing is sold out and the store is closed. Click here to see the October 20 2016 Onell Design drop menu. The trend to incorporate sidekick figures - or just apply the plastic and paint of one figure to another - is delightful. Crayboth Zekroyas is a tiny little crab guy, designed to match Alpha 7 Zekroyas [FOTD #1,535] from the same wave as well as a Quallerran, too. I already bought one version of this mold, but a painted colorway of Mega Bit Pheyden - a Standard Set - seemed to be an essential purchase. (I'm also interested in a green "bad graphics" one and/or glow-in-the-dark someday.) Pheyden in Pheyden colors is an important thing to have, and this blocky one is nothing if not charming. If you got the Mega Bit Pheyden Trophy Set [FOTD #1,531] the figures offer little new other than changes in color, but they're good changes in color. 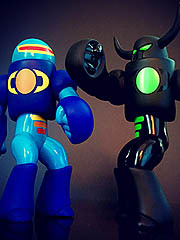 In addition to these figures, an unpainted blue duo was also put up for sale. Made of aa couple of dozen parts, this figure is amazing if for no reason other than its color matching skills. The Order Bobaran's inspiration is baked in the colors, which RawShark Studios kingpin Jesse Moore somehow painstakingly matched or maybe he just blackmailed someone to get the Pantones perfect. It's based on the original mail-away (and retail) Kenner Boba Fett Star Wars action figures, a true classic and one of those things that's both an artifact of great mythological significance while oddly being a staple of millions of children's toy boxes almost 40 years ago. As an inspirational force behind Callgrim, it only makes sense that the character would be adapted to these original needs. 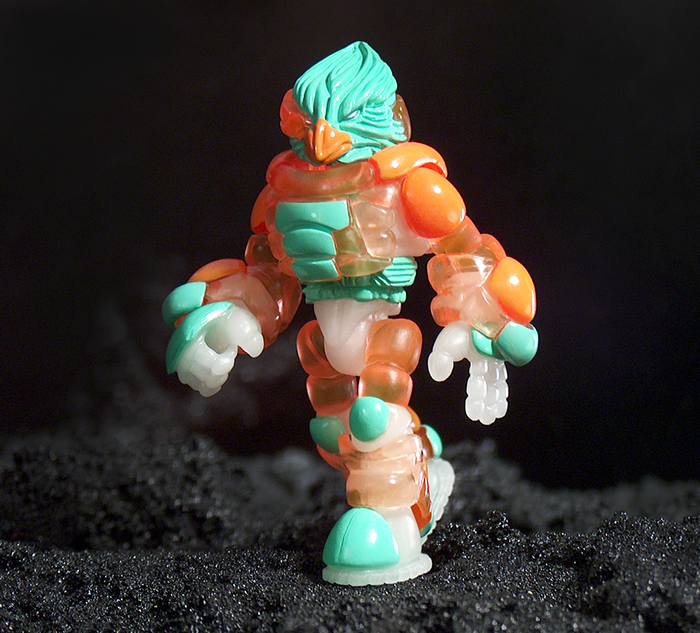 One of the things about Glyos that eventually gets to me is the names - I can't keep all of them straight. 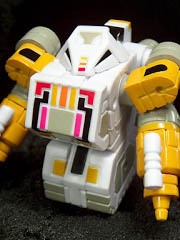 When I look at the Gendrone Force Defender Villser Core it impresses and delights me, while also terrifying me that I will never, ever remember what it is called. 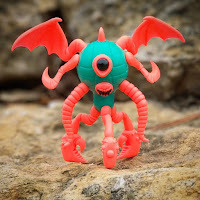 I think that has contributed to my lack-of-hardcoreness with the Glyos world as it goes on, mostly because there's so much great stuff, which I have bought and admire, but I can't actually talk about it without a crib sheet. It's a green take on the ToyFinity Robo Force mold, with some wonderful paint applicatins and a color that reacts in fun ways depending on how it's lit. It's also hefty, providing you with 41 pieces for $16.00 - and they're big pieces. They're saying that they "will be ready to celebrate in true 1980's style, dressing up for what might be our craziest assortment since we started back in 2007." Well! I'm interested. Hey, it's a classic! I got the Rhino - Flesh a couple of years ago, and basically shot it and had him ready to review - I like to keep a few figures around for a while so I can look back on them and see how they turned out after a few years. Rise of the Beasts was a Kickstarter project that got funded, but due to some factory issues was pulled at the last possible minute - and later released, sans Kickstarter. Later, a second series went to Kickstarter - this did not get supported. In this time a grand total of 20 PVC figures were released, each of which had 4 points of articulation and was based on one of two sculpts. 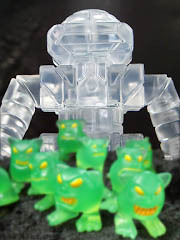 As is popular, they were eventually run in "flesh" plastic like the popular vintage M.U.S.C.L.E. line, which to this day remains one of the gold standards for collectible minifigures. I bought a sack of animals and a sack of ninjas, and didn't complete either set. With the animals, I think there were some oddities. For example, Pup - the dog - came in unpainted orange and painted orange, as expected. He also came in grey, the cat color, with a pink nose. Well, I was surprised - but I like weird variants, and this was indeed a surprise as we're not entirely sure what all got made yet. In addition to all of these, the manufacturers sold gold figures direct to the consumer. A new drop! 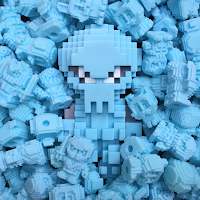 Spy Monkey Creations debuted a new drop with 10 new figures. An all-in package was $124 (no discount over singles) with individual figures in the very, very slow-loading shop ranging from $10 to $15 each. The first-ever glow-in-the-dark figures were joined by some very nice new colorways with some of their more creative paint applications. I would be a hack to say this figure deserves glowing reviews. I'll do it anyway. 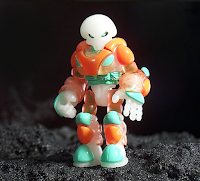 While the mock-ups for this Outer Space Men figure were painted white plastic, this glowing Cosmic Radiation Edition Colossus Rex is 5-inches-and-change of solid glow-in-the-dark plastic. 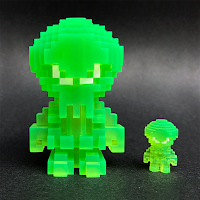 If you collect these guys, you're probably wondering how the glow plastic of this convention exclusive (available this weekend in New York at NYCC) stacks up against other Glyos figures. I can say that the 2010 glow Metamorpho and the 2011 glow Electron+ are a little paler, a little more boney in color than this guy. 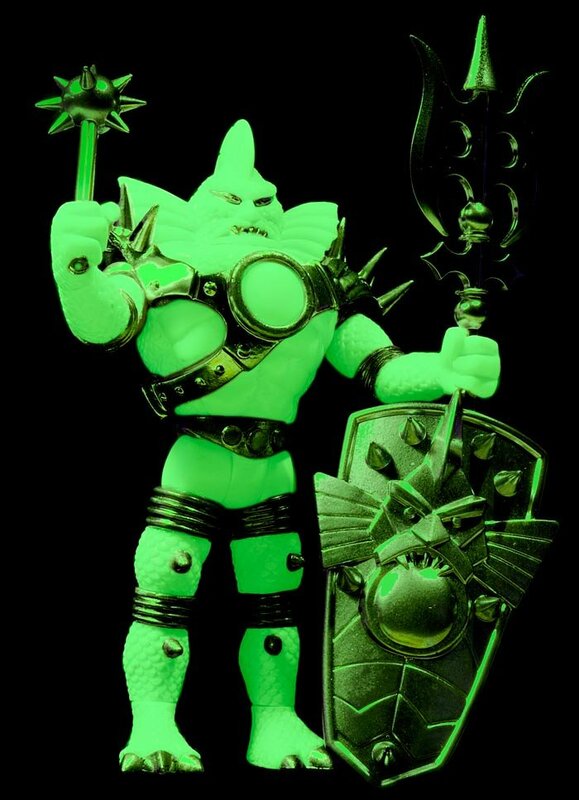 Glow Rex is a near-perfect match to the many other Onell Design (and adjacent) glow Glyos figures like glow Gobon, Leyden, and many many others. They all vary a tiny bit, but it's superbly close. 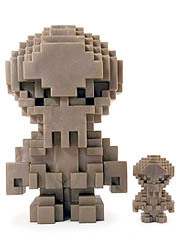 The first 10 Bit Figs, plus a Jumbo Pheyden (and a mini one) are available from Culture Pirates in test-shot gold. Like, right now. Before you check out, they also have some other ones plus they sell some CDs and records from various bands with which they have an association. I've bought a few and so far I'm quite pleased. I ordered these buggers too because of course I would. They're back, again, Friday night! 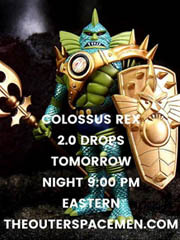 In about 20 hours, you can get Colossus Rex 2.0 - the bluish variant. Check it out on the Instagrams. Anyway. More are coming, this one's first, keep an eye on this space for more, don't ask why just buy buy buy, etc. Galaxxor is back! Well, Roxxalag, Infernicus, and Thanyr are - and they're quite pretty. 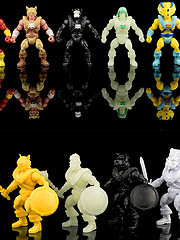 Armed with alternate heads and fancy tampos, each vinyl figure is Glyos-compatible and $30 (plus shipping). They measure 5 1/2-inches tall, and can be yours if you don't forget to order them. They go on sale at 8:00 PM Central on Monday evening. Colossus Rex 2.0 - this will debut on the official Outer Space Men web site, and will also be sold at Star Trek Mission New York (September 2-4) and also New York Comic Con (October 6-9). The figure is slightly closer in the rich color of the original Colorforms release 50 years ago, but includes gold - rather than purple - accessories. If you missed the original figure, this is a much cheaper alternative to the secondary market. If you didn't, it's different enough that you may wish to get one anyway. Gamma X Cosmic Radiation - This will debut at Star Trek Mission New York (September 2-4). The original Infinity Gamma X was covered in a light layer of glowing paint, which didn't glow fairly well. It was colored similarly to the original prototype figure, but didn't glow well. 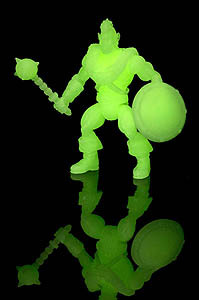 The new Cosmic Radiation edition is cast in glow plastic and looks like it will brighten the night. It's a worthwhile upgrade.